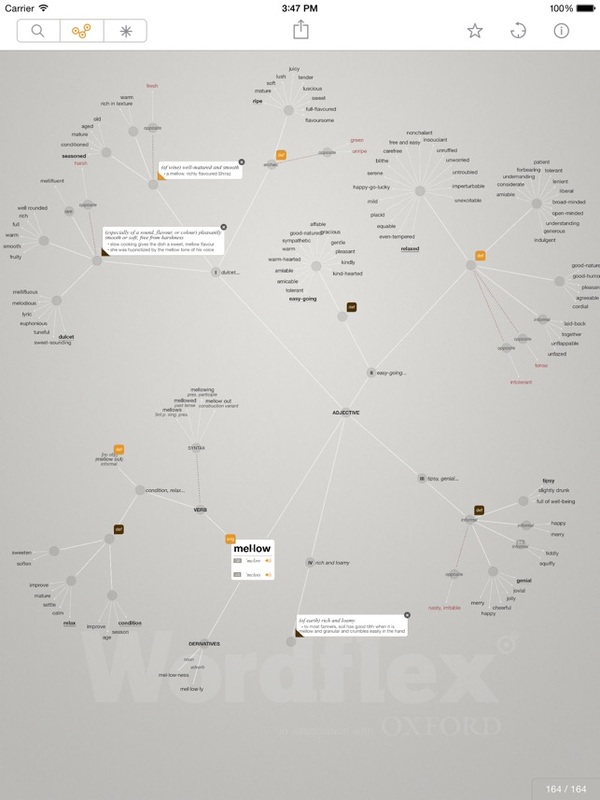 Wordflex Touch Dictionary is a living dictionary. To begin, users should tap the “Magnifying Glass” button on the top left of the screen and then type a word into the box provided. 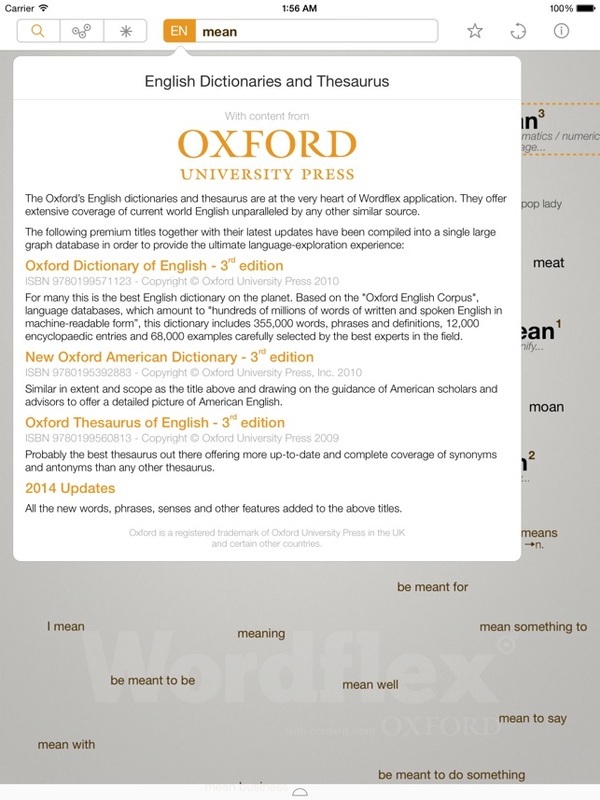 As users type, the app locates the word from its dictionary (and the dictionary includes words, people, and places). Users then tap the word, and the app quickly grows the word’s tree, which includes the word’s derivatives, its parts of speech, pronunciations, origin, and definitions. Users must then tap on the different parts of the tree to make it grow and access more knowledge, and users can bookmark words as “favorites” by double tapping anywhere on the word tree. To navigate the app, users can tap the buttons on the top right of the screen. 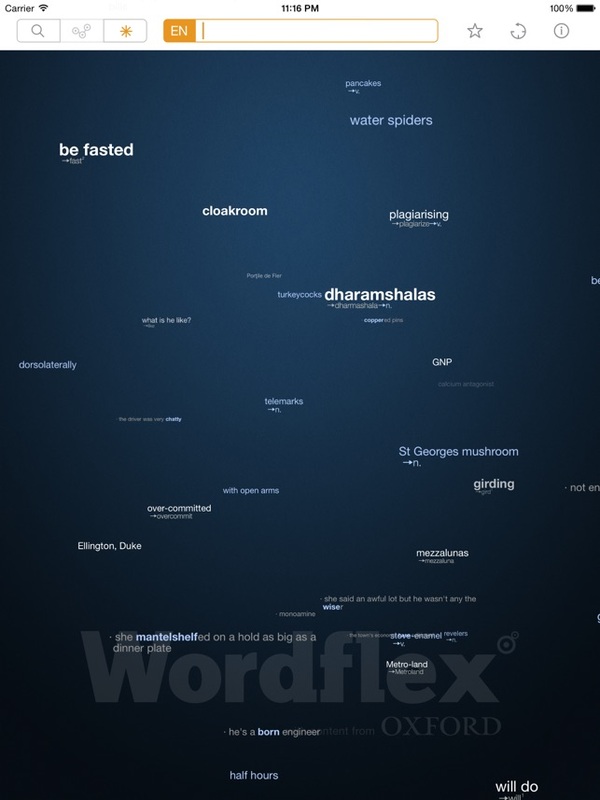 The “Star” button lets users see which words they have favorited, words that contain illustrations in their entries, and the Top 1000 words. The “Arrow” button lets users see which words they have searched and when they conducted the search. 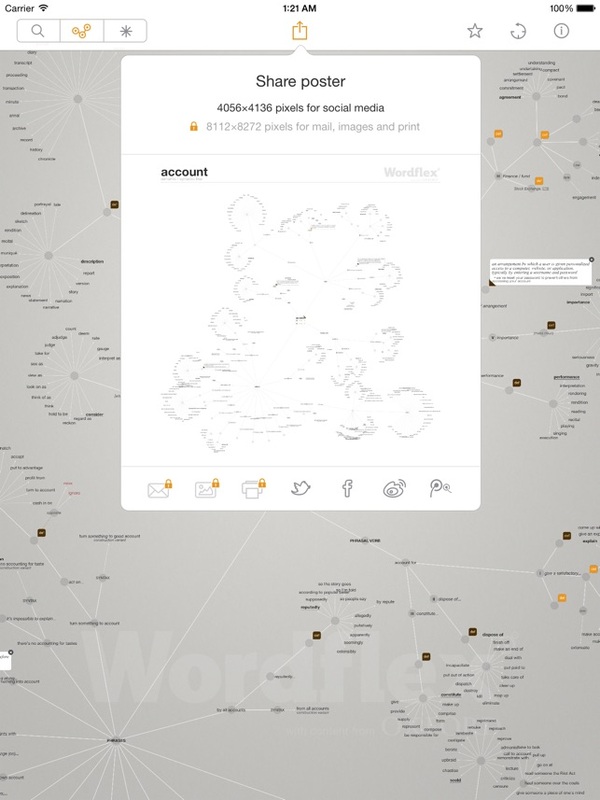 If users want to share a word tree, they can tap the “Upload” button on the top center of the app, which allows them to share it over social media. Please Note: Additional options are available in this app, which includes sharing over email and access to more than 20 words per day. These options do require an in-app purchase. When students are reading a text and come to an unfamiliar word, they can research the word using this app. Next, students can use an Office app to write a sentence that uses the word contextually. These sentences can be emailed to their teacher for grading or posted to a class website. 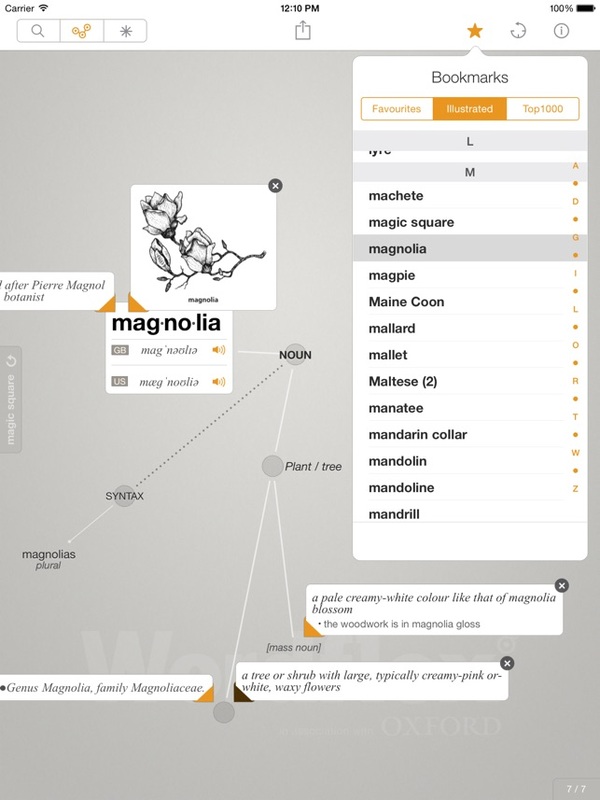 As part of a creative writing activity, students can draw a word from a hat and then look up the word and its family using this app. Next, students can compose a short journal or story that uses all the words listed in the original word’s word family. Students can compose their writing using an Office app, and they can share it by posting it to a class website or by reading it aloud. When creating digital flashcards or quizzes using apps such as Flashcard Pro or MySAT, students can use this app to list information on the card or quizzes, such as the word’s definition, derivatives, and parts of speech. When adding entries to a class word wall, teachers and students can look up a word together using this app. Next, teachers and students can discuss which parts of a word’s tree they would like to add to their word wall. To facilitate this discussion, teachers can ask: (1) What is the word’s meaning? (2) Does the word have different meanings? If so, which meaning(s) should we include on our word wall? (3) What is this word’s part of speech? Does it have multiple parts of speech? (4) If it has multiple parts of speech, do they impact its meaning?, and (5) Does this word remind you of another word you know? If so, what is that word and should we include it on our word wall? Word Challenge educational free matching game, addictive, fun & trivial puzzles!